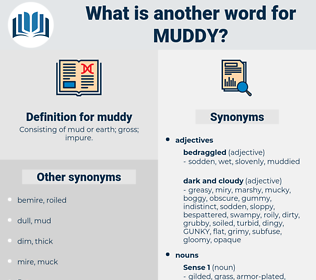 What is another word for muddy? Consisting of mud or earth; gross; impure. clean, clear, light, sterile, vivacious, dry, sharp, understanding, pure, good, bright. immaculate, tidy, perfect, cleaned, bleached, ordered, unspotted, sparkling, purified, neat, cleanly, untainted, wholesome, whitened, colorless, flawless, untouched, orderly, combed, groomed, shiny, clarified, cleansed, undefiled, unblemished, uncolored, unpolluted. The whole of this, which had previously been a solid bank of grass and earth, was now nothing but a muddy pool. Why the Bagobo Likes the Cat An old man was fishing in the brook; but the water kept getting muddy, and he did not know what was the matter. madia, moiety, mad, mammoth, mod, mouth, memento, menotti, mete out, mid, matte, mamet, meth, muhammad, manhunt, mote, manet, method, mediated, Mutawa, mood, manned, montia, midday, minnewit, mint, medea, month, matt, mined, minuend, md, meaty, maenad, mayday, momotidae, minutia, moneyed, mandate, mediate, mayweed, mutate, moat, maund, manta, mat, meat, mediety, monad, math, maid, meed, mount, myoid, muted, mated, myth, mohammed, maidu, manteidae, mut, manatee, manat, meadow, Mothy, moated, minded, motto, mt, momot, maimed, munda, monet, matey, mend, motet, monnet, monody, mahomet, mead, man-made, manumit, mantua, manihot, monday, minuet, matai, mahound, midi, moment, monied, moot, Mahdi, miniate, moody, mantidae, maidhood, muddied, minuit, mutt, Mohammad, matthew, middy, mott, mammut, maundy, mountie, med, mitt, mud, monod, mute, matted, monument, meade, manhood, manidae, mate, may day, meditate, mot, monte, mennonite, mode, metadata, MDI, minute, mind, mound, mentha, moth, mimidae, mite, manda, manteodea, meet, made, meted out, mande, mammutidae, Mete, mit, mantid, mounted, midway, mahout. colly, bemire, dirty, soil, begrime, grime.